A lot of you have been asking me some technique questions when it comes to attaching a d ring or purse handle hardware to a knitted or crocheted garment. I have attached a pictorial tutorial. 3)Repeat on the other side . It’s that time of year again, sheep and wool festivals galore! Maryland sheep and wool and New Hampshire Sheep and wool have come and gone already. This weekend on Long Island, we will be hosting the Long Island Sheep and Wool festival in Riverhead, NY at the Hallockville Museum. So what is a crocheter suppose to do? Shop till you drop of course! The crocheter will be exposed to so many great new ideas, yarns and projects it is pure sensory overload. 1) Try to have a project in mind that you are shopping for. 5) Don really comfy shoes to make all that walking more pleasurable! 6) Bring a yarn estimator with you so that when you find a yarn you fall in love with you can buy how much you think for a project. – A crochet project takes approximately 30 percent more yarn on projects when compared to knitting! 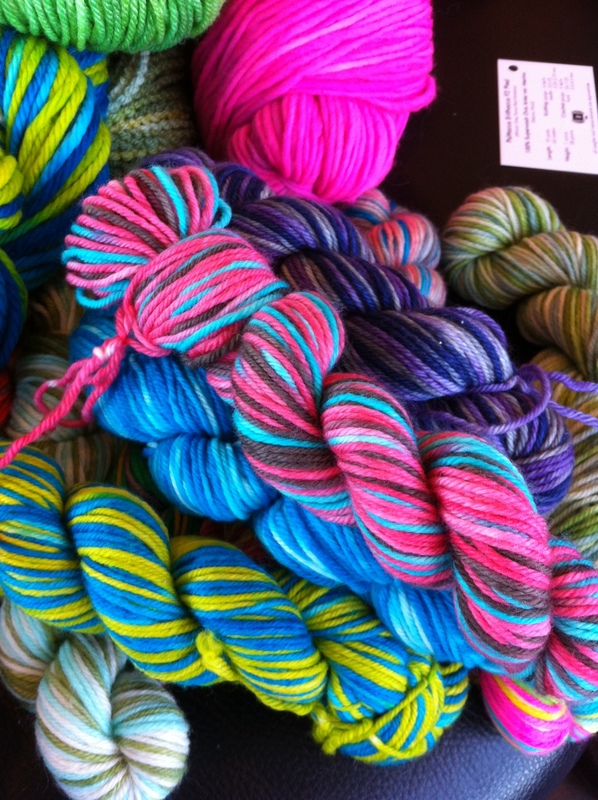 – Yarn market has a great app for the IPhone! 7) Check the Websites and appropriate social media sites for your favorite vendors as they may be running show specials! 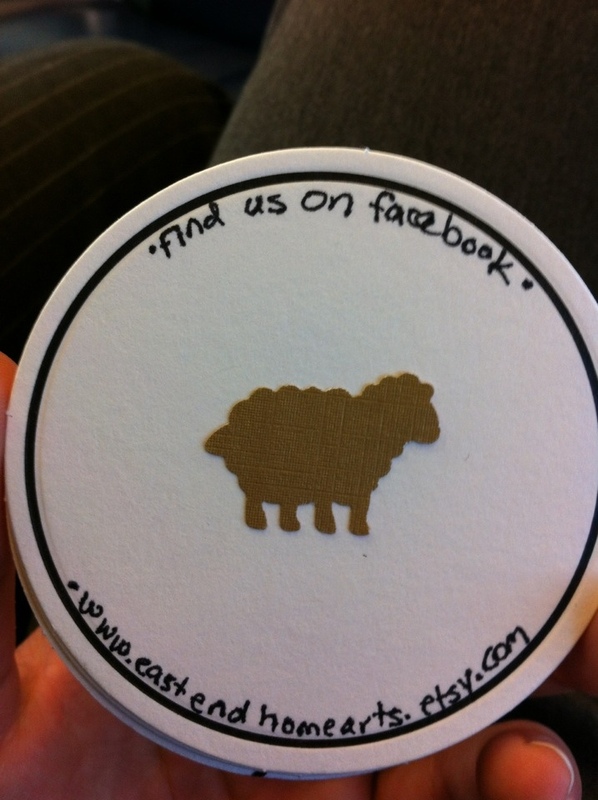 – Green Mountain Spinnery had various trivia contests at Maryland Sheep and wool! Great idea guys! 8) Always good to have a portable project with you that you can conveniently hook while you wait! 9) Bring some great snacks as shopping always makes me hungry and who really wants to stop for food when you can be hunting out the greatest yarn! 10) Water and hand sanitizer need I say more! Enjoy and I would love to hear about your experiences! Comment and be entered for this weeks blog giveaway! My favorite stitch patterns are those that have a rhythm. Last night I was putting the finishing touches on my cousins wedding gift and afghan I have been designing for quite sometime now. I was looking for just the right stitch pattern for the block. I was using the Crochet Stitch Bible as my guide and found the diagonal relief stitch which was perfect as all the beige blocks had some texture to it. As I started to stitch, I realized the awesome two stitch switch pattern that combined fpdc and bpdc my hand sung as it stitched across the row! Got to love crochet! 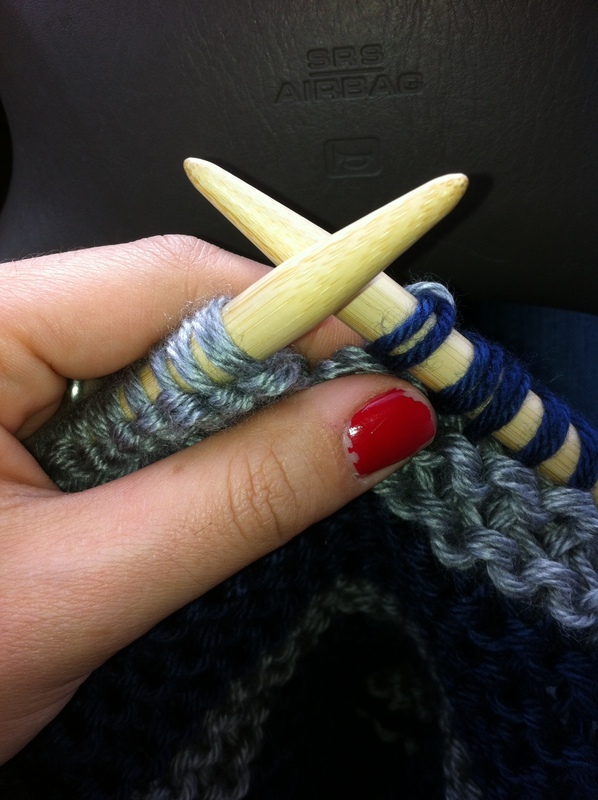 What’s your favorite crochet or knit stitch? 5 comments and free pattern will be posted. So close yesterday! 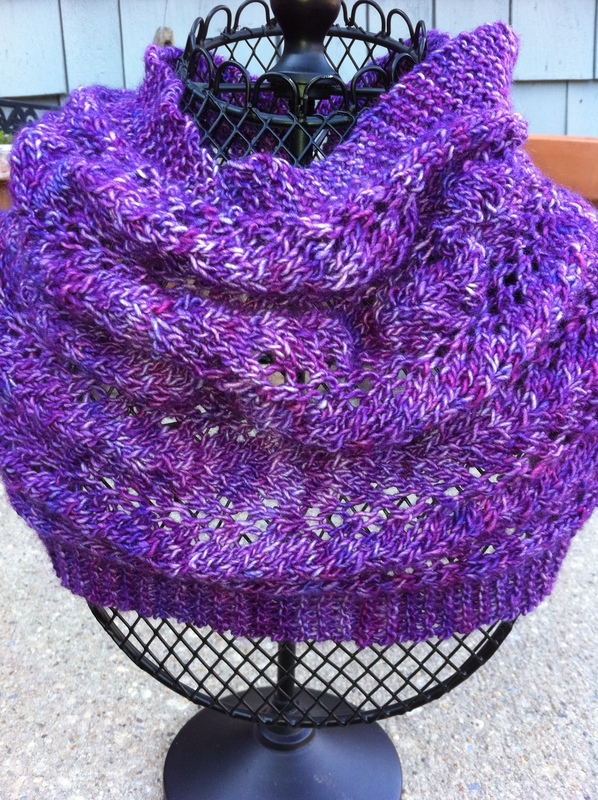 For all of you who are patiently waiting here is the pattern for the Ice Wine Cowl. Created and designed for me for Purl by the Sea. Seam cast on edge to bind of edge and enjoy! Want a challenge? 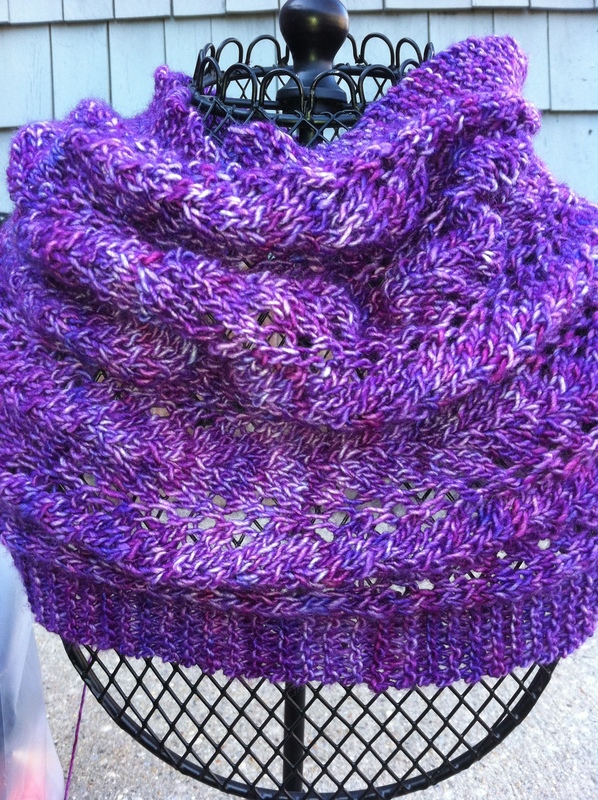 Use a provisional cast on and don’t bind off and use either a three needle bind off or Kitchener stitch to complete the circle to form the cowl! Would love to see finished pictures and comments! This piece seen live is absolutely amazing. The simple construction is hidden in the elegant lace detail of the collar and the sleeves. 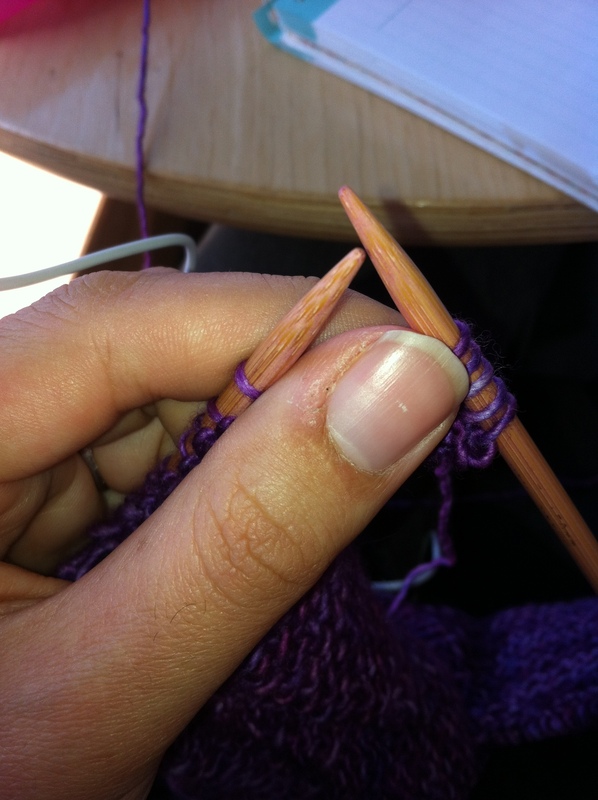 The piece is made in 5 pieces making it totally suitable for knitting on the go! Watching various people try it on at Purl by the Sea, I can attest to the fact that it looks good on various body types! Make this elegant Cardi wrap and it will be sure to please! As promised yesterday I am reviewing the pieces of Vogue Knitting’s Spring of 2012 issue as I saw them all in person at an event celebrating Purl by The Sea’s one year anniversary. The first piece to review is none other than the cover piece itself by designer Shiri Mor ( who happens to be a friend of mine and I admire her work greatly!). The piece was exquisite and because it was quite the chilly day out in Montauk, Carla herself donned this exquisite poncho to add a bit of warmth to her attire for the day. It is moments like this when I wish I would have taken pictures but I was having so much fun who was going to stop to take a picture. The benefits to making this for your spring wardrobe is that the garment construction is simple so as to avoid lots of increasing and decreasing in lace patterns but the detail in the hand stitching will keep you interested and on your toes! 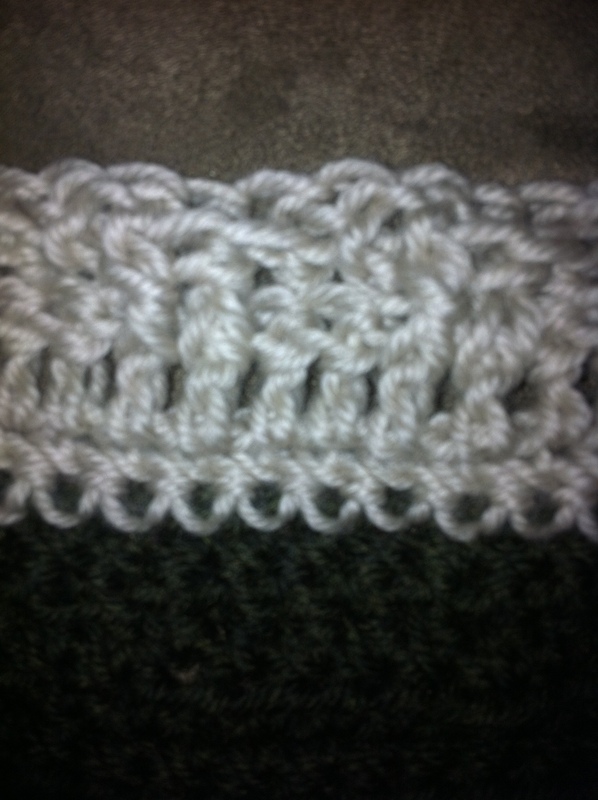 The panel has a 20 row lace repeat that is easy to recognize when you knit up so as to avoid making mistakes as you knit. Also great to make as a gift because the sizing is for one size fits most! 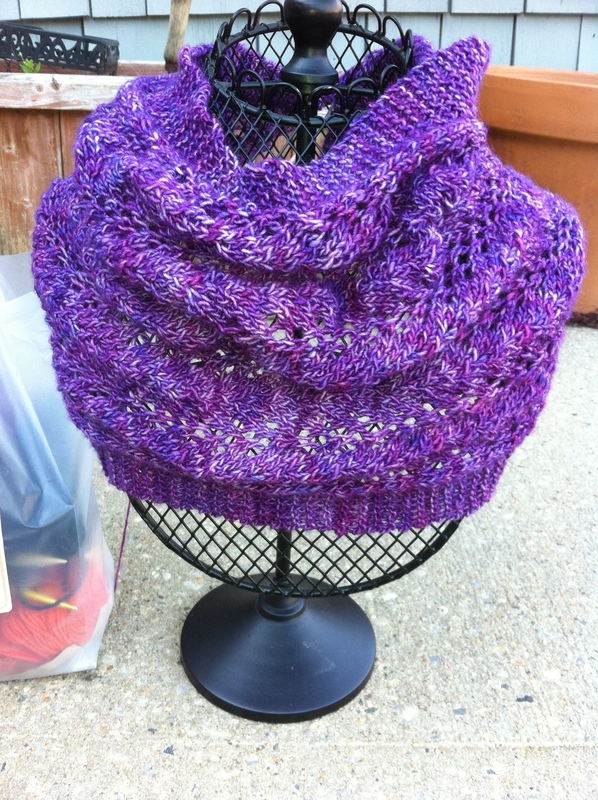 This piece is a hands down winner to add to your spring collection of hand knits! Great job Shiri and congrats on the cover. Comments welcome! Will post the cowl pattern tomorrow! If anyone has pictures of the event please let me know so I can post them! A while back I had written about how happy it makes me when the spring knitting magazines arrive at the local yarn shops. Today, I got to experience Vogue Knitting’s spring line in person! It’s even hard to put this experience into words! Purl by the Sea in Montauk, NY was celebrating their one year as well as the opening of the new shop! Nora had invited Vogue Knitting to come to the shop and they came! Executive editor of Knit Simple magazine and knitting editor of Vogue Knitting Rosemary Drysdale brought the issue to us. A slide show of the spring issue helped us to appreciate the details of the work. They also brought about 20 pieces from the magazine for us to see, try on and admire! Carla wore the cover sweater by Shiri Mor as she presented. Mari Lynn Patrick’s mohair silk sweater was amazing to see in person. There were so many and I will write about more tomorrow as I am nearing 10pm and have been up knitting every night until 2 this week preparing to go out to Nora’s. I also designed two patterns for the event. 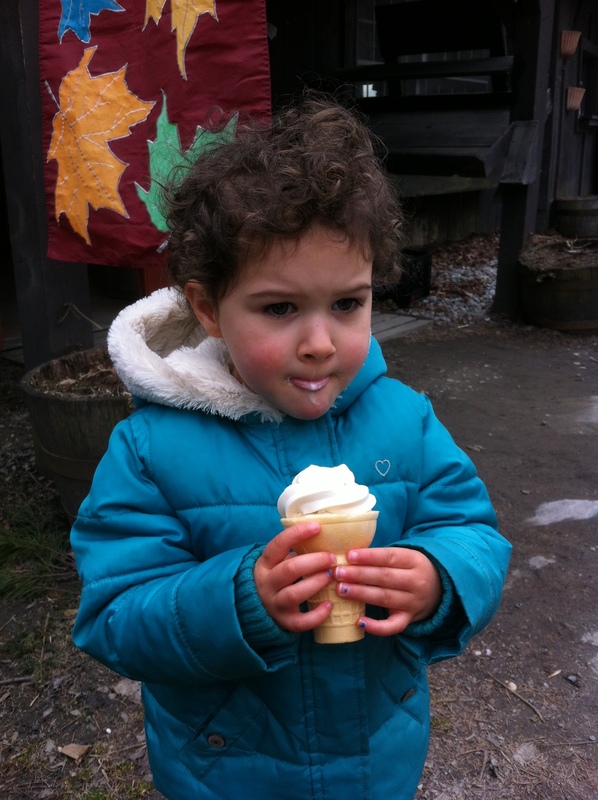 Which I will probably post for all my loyal blog readers. I also presented a healthy knitting lecture which was fun as well. Overall an amazing day and I also won a Della Q messenger bag! Yeah! Will definitely write more tomorrow when I have my issue in front of me and give details about the garments I saw first hand! I heart Vogue Knitting! Comments appreciated! If you were there double bonus!! !